This Easter do not miss out on our ‘Easter Eggs-pedition experience’ on the speediest Easter egg hunt you’ll ever embark on! Our Easter trip is a fun-filled experience for the whole family to enjoy! Hop on down to the London Eye Pier for an egg-cellent (sorry!) trip along London’s famous river. With Easter fact files in paws you’ll need to search the banks of the River Thames to find all the hidden Easter tourist attractions whilst sailing along the iconic river. Tick off the famous landmarks around the city that are located on the provided map and earn yourselves a heap of Easter chocolate to indulge in on board. You’ll hunt out the most iconic sights in London – with bunny ears at the ready see the London Eye, Tower Bridge, Big Ben, The Houses of Parliament and more (and don’t forget to take lots of snaps and selfies whilst on board, tagging @thamesrockets)! 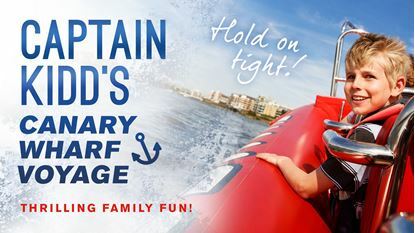 Once you have sailed under Tower Bridge our skippers will then push their paws to the pedal and bounce all the way to Canary Wharf, guaranteeing all the family will have the time of their lives, screaming with egg-citement (sorry again!) whilst being on the fastest Easter bunny chase in the capital! This amazing trip is only running from Saturday 13th April until Monday 22nd April 2019 so be sure to book your tickets soon! What could be more fun than an Easter themed London experience? The whole family will love it! 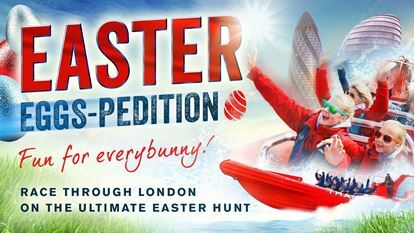 What’s more – why not enter our competition to WIN a FAMILY TICKET (2 adults 2 children) on board our Easter Eggs-pedition? All you have to do is head to our Facebook page and post a picture of you on board our speedboat, tag @ThamesRockets and like our page! The lucky winner will be announced on Friday 12th April 2019 at midday! Or if waiting that long makes you hopping mad why not book your tickets now to have an egg-citing (we can’t help it!) ride on London’s #1 Speedboat Company this Easter.